A fun twist on a Meatball Sub! Roll each dinner roll into a 12-inch rope. Skewer one end of the rope, then a meatball, wrap the dough half way around the meatball and skewer the dough again, then another meatball. Continue this process until you have 3 meatballs on your skewer and end with dough. Position the meatballs at least an inch apart on the skewer. Repeat with all 12 rolls. Lay on sprayed baking sheets and bake at 350 degrees F 18-20 minutes or until dough is golden brown and meatballs are heated through. Combine butter, parmesan cheese and dried parsley and brush over subs. 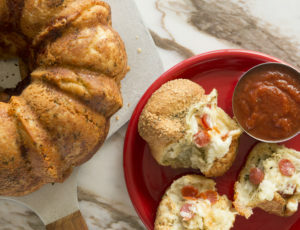 Serve with marinara sauce for dipping.